We are so lucky to live in Northumberland. People travel thousands of miles to visit us. Our castle's are a huge attraction. 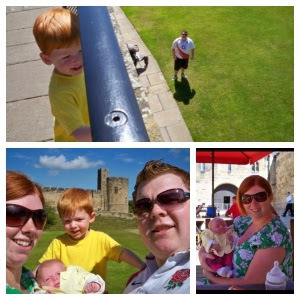 We have already visited Bamburgh and Warkworth castle this year and loved them both. 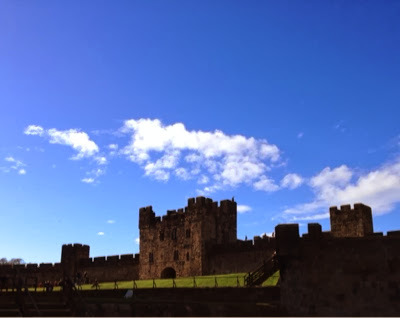 Alnwick castle is the castle we have visited the most and is probably the most famous due to it's Harry Potter connections. We haven't visited for a few years though, in fact the last time we paid a visit was Spring 2009 when Heidi was just a few weeks old. Cringe at the hideous family selfie! So when we were invited along this year we couldn't wait to see what they had to offer. The day of our visit was crisp, clear and typically Autumnal. Our boys enjoyed collecting what we later discovered to be hazelnuts on the long but picturesque walk from the carpark to the castle (£3.50 charge for all day parking - have some change to pay the attendant at hand before you leave). 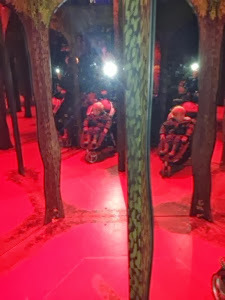 The walk is quite lengthy with toddlers but because you pass the treehouse, some friendly ducks and various stalls along the way it doesn't seem too bad. The walk leading up to the castle provides some spectacular views. Although there are some cobbles we found the castle to be very buggy friendly. The state rooms were closed for winter on the day of our visit and the car park attendant informed us that entrance would be half price because of this. Bargain! 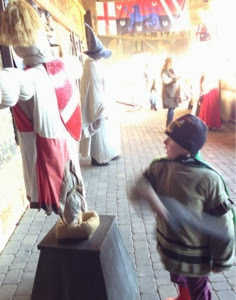 Our first stop of the day was the Knight's Quest area where we were told all the action is. 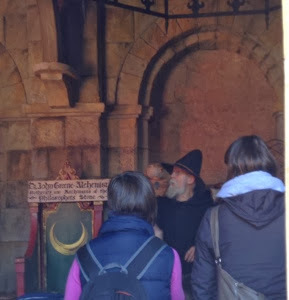 We reserved our space on the 11:30am broomstick training course and decided to take on the Dragon's Quest challenge. 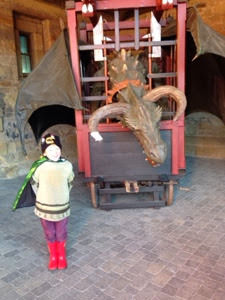 The dragon's quest is a new addition to the castle since our last visit. 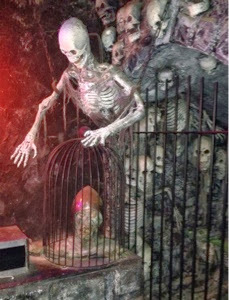 Children are advised to enter with an adult as it can be quite scary in places. 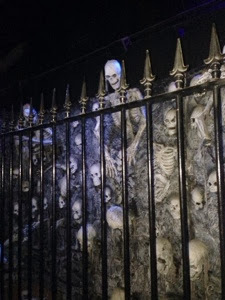 Expect to encounter skeleton's, mirror mazes and giant dragon's! My children survived but I don't think my daughter would have tried it a second time. You can watch a short video of the quest here. 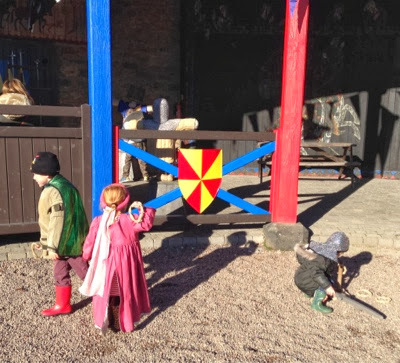 So, after the Dragon's Quest we went in search of something a little tamer and decided to dress up as medieval knights and princesses. There is a huge selection of costumes to choose from and staff on hand to help choose an outfit and ensure the area is kept tidy! Heidi decided to be transformed into a princess. 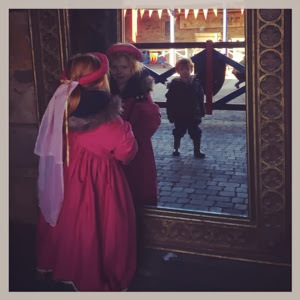 I love how there is a huge mirror you are encouraged to admire yourself in once your makeover is complete. Harry decided to become a dragon! 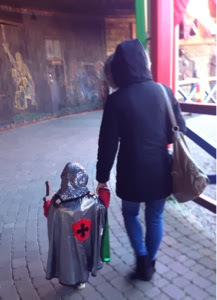 We also had a mini knight in our group. Super cute. 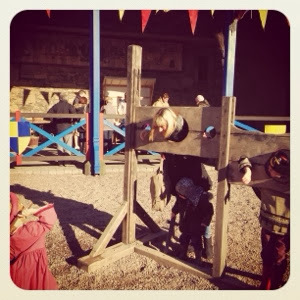 Putting Grandma in the stocks and throwing rats at her! As you can see there was lots and lots going on and loads of fun to be had. 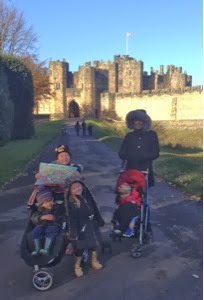 Before broomstick training we decided to take a stroll around the castle grounds. They are very safe and a great place to let you toddler run about. We had lots of fun pretending to fire cannons at our enemies by the river. The views are simply breathtaking and I really look forward to returning one day without my children and take the time to take some proper photographs. 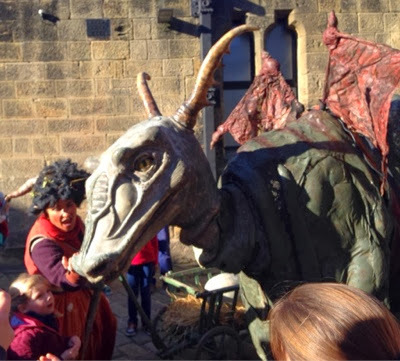 We bumped into a fire breathing dragon on our travels. He was friendly though and even let us give him a little stroke. 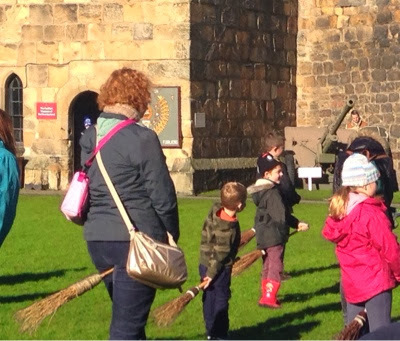 Broomstick training was all my 7 year old had been talking about the whole time we were walking around the castle. He was very keen to get started. Our lesson started at 11:30am and was inclusive of everybody no matter how big or small. 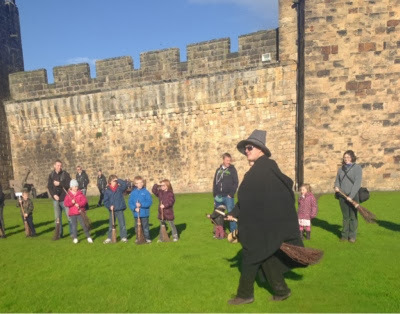 The staff who provided the lesson were really entertaining and we learned how to mount, manouver and whooooosh on our very own broomstick. The 20 minute lesson was great fun and there were lots of giggles. We had certainly earned our lunch after our super busy morning. 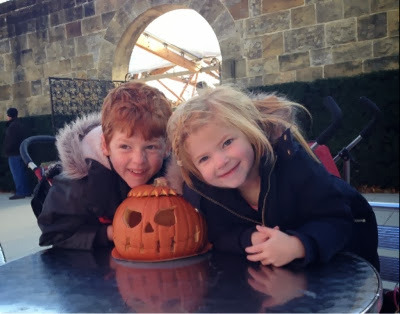 We had planned to eat in the courtyard cafe however the queue was out of the door so we decided to walk to the sandwich shop at the entrance of Alnwick garden. We quickly found a seat here however service was very slow and children's meals were £4.50 for a sandwich, juice, fruit and mini cheddars so a little on the pricey side. In future we will definitely choose to eat either at a non-peak time or take a picnic as there are plenty of picnic spot's around the castle to enjoy. 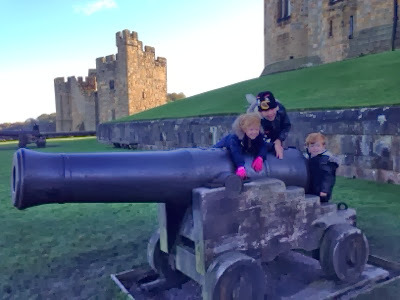 So, our verdict on Alnwick castle was we LOVED it! It was really toddler and child friendly and there is always lots going on. It was absolutely stunning as well. We could have easily spent all day here. You can visit the woodland walk and treehouse free of charge too. If you buy your ticket in 2013 it will be valid for 12 months. Check website for up to date information. 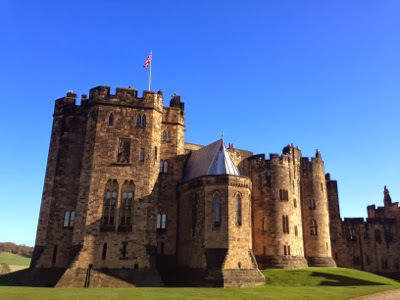 Disclaimer:- we received complimentary entry to Alnwick castle for the purpose of this review. All views are our own.